German game developer NG:DEVTEAM has released a new update on their in-development NEOGEO MVS title, Kraut Buster. 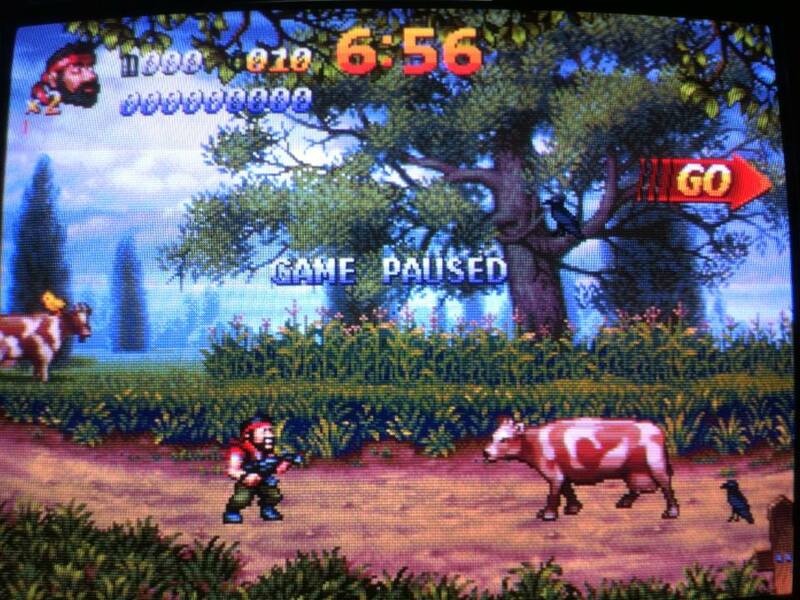 When first unveiled, the game received a mixed reaction based upon it appearing to be ‘just a Metal Slug clone’, but with the new update they are striving to point out some of the major differences, particularly the “Contra-style controls”. They also have implemented a Mask power-up system, where the player gains different abilities (different jumping, bombs, etc) based upon that mask. The trailer shows many of these differences, including the addition of a ‘sidekick’ drone-style addition, something more common in scrolling space/plane shooters. – Mask feature. Wear different masks to change your characters abilities, your weapons, change your surroundings and enemy behaviors. – Chicken mask: become John Chickenstein and rescued chicks will join forces with their Gatling guns. You can also float slightly down with your feather power and drop big egg grenades. – 13th Splatterguy mask: turn the fight into a blood carnage with your super charged long range machete. Rage flows early through your body. Knife throwing chick sidekicks. – Wolf mask: supercharge your weapon power and make the grunts your little pigs. Rage flows early through your body. May have reduced scoring potential, but is easier to play. – Pig mask: sniffle out secrets like a truffle pig and don’t get eaten by the big bad wolves. Your tasty bacon body withstands a few bullet hits. Reduces difficulty in a passive way. – Japanese “Tengu” demon mask: Jump as high and fast like a Ninja, use a Katana for close range attack and lay fused bombs (use them tactical). Also 3-way shuriken throwing ninja chicks. Currently we have 5 mask implemented, but we plan to add 4-6 more, like “Vampire Hunter” mask (chain whip in the dictator’s castle? ), “Gunlord” mask (maybe with his wheel bombs? ), “Uncle Sam”, “McKraken Nerd mask”, “Chainsaw killer mask”. The possibilities are endless. – Rescued chicks can act as sidekicks (depends on the mask). For example they shoot a Gatling gun, throw shurikens and knives. The amount of chicks attached change also their behavior. Spawning run-in enemies in some run’n’gun sequences. – 2 players can co-op/interact with each other, like standing on the shoulders of each other to reach higher places. The score counter is shared for maximum co-op feels. – Mid bosses and mini bosses are more fantasy based like War-hot-air balloon, WW2 style mechas “Schneeläufer Ausf. B”, “Über Soldiers”, “Russian War Bears”. It’s probably one of the most ambition pixel arts games made in a long time. No other company out there besides us is doing real 16 pixel art arcade games anymore and especially not in this scope. – choose up to 3 different routes/difficulties with changes in length/map design/enemies and attack patterns. – 60FPS/60Hz twice as fluid, twice as responsive, zero the lag of MS games. – one of the biggest and most ambitious games developed for NEOGEO since SNK’s unfortunate demise in 2000. If you still think it’s just a clone, just think of it as an in-official sequel. But with completely new engine, completely new graphics,completely new music, completely new stages, completely new enemies and completely new game play. Some thoughts – Some of those highlights above speak for themselves – NG has had to do some damage control thanks to some jumping to final conclusions with the first trailer. This is the reason many devs hold back on announcing new content since first impressions are important but the difference between an alpha and a final software build can be chasms apart. 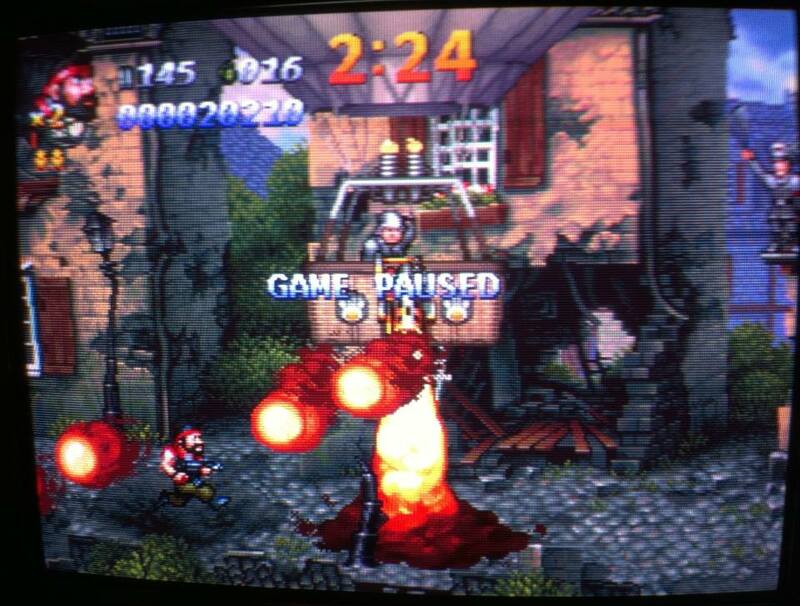 NG has been sharing some “CRT shots”(such as the shots in this post) of the game lately and I agree with their assessment of their own art – I think it looks really good for the hardware, fitting into the era perfectly. They include a lot of shading and details that one would have expected to find in such a game from the 90s, it isn’t something that I would think is a simple task. So kudos to them for taking the time and making the effort like this. The other features also should help this stand out from Metal Slug’s shadow and more of an entry into Run ‘N Gun games (let’s not forget, MS is hardly the sole occupant of the genre), plus anything else they decide to do over the remaining development period. Kraut Buster is slated for a release to the MVS arcade system in Spring 2016 so there is a still a long way to go. What are your thoughts on these updates?